Focusing rails for stacked focus with a Canon 65mm MP-E f2.8 macro lens. When we began to start doing stacked focus with a Canon 65mm MP-E f2.8 macro lens, the first thing we learned is that some focusing rails are almost useless. An old model from Really Right Stuff was so bad that even my assistant refused to use it. I would hope that they make them completely different today, and that they are more steady. It’s that when you loosen them to move the camera, the whole thing gets loose (has to, otherwise the camera won’t move!). But it’s a good case of “you get what you pay for.” Perhaps this early model was made only as a single-focus aid, not for stacked focus. We don’t recommend this model for stacked focus (it had no model designation on it, but the name Really Right Stuff is repeated on three sides). 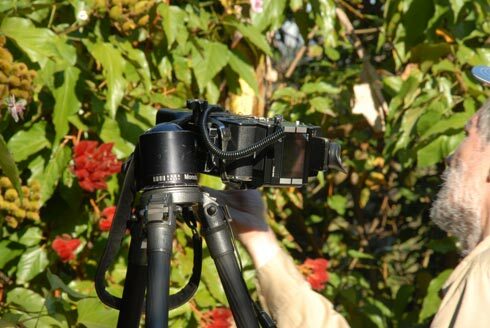 Reviews of focusing rails with macro lens, for stacked focus of insects and flowers. 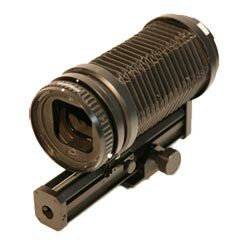 If you spend less you may get a focusing rail that is useless (like our old one from Really Right Stuff). I do not know if their B150-B is a new model; there is absolutely no model designation on mine (just the name of Really Right Stuff). Two decades ago I did most of my macro photography with a Leica bellows and then with a Hasselblad bellows (with 120mm Zeiss macro lens). But if the object you are photographing is really small, like most tiny orchid flowers or the flowers of cacao (cocoa, chocolate), then medium format is too large. So doing macro photography is one application where medium format is not much advantage (otherwise, most digital photography at FLAAR is accomplished with medium format cameras such as the Phase One P 25+). 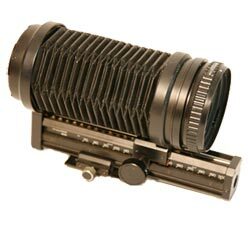 Here is the Hasselblad bellows, over 30 years old, still works fine. First posted Feb. 6, 2008. We are adding new pages and new features so it is not always realistic to update old pages. All the old equipment is still available on eBay, so we keep even our old pages. If you wish only the most up to date product reviews, these are in PDFs (not in the web pages, but in PDFs which are linked in the columns at the right of every page. By later in 2011 each of our web sites will be in 21 different languages with instant translation (and better than merely old fashioned web page translators of several years ago). So far all the languages are available on www.FLAAR.org and www.3d-scanners-3d-software-reviews.org. Next will be our fine art photography, giclee, decor web site.